Foo Fighters made a return to Gothenburg, Sweden, last night (June 5) as part of their tour behind Concrete and Gold — three years on from Dave Grohl famously breaking his leg after falling offstage in the city. 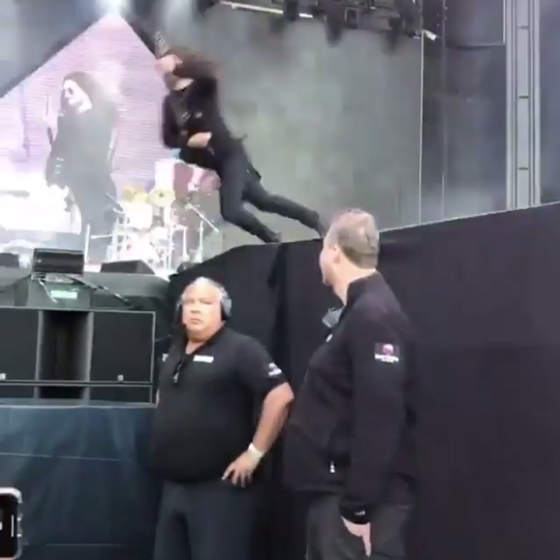 In paying homage to the incident, the band decided to enlist the help of a stuntman as opposed to their frontman this time around. As you can see in the clips below, Grohl's Foo Fighters bandmates take the stage ahead of him, only to have a Grohl lookalike run out behind them. After some fist-pumping and guitar swinging, the doppelgänger makes a misstep and falls from the edge of the stage. The real Grohl then emerged from the side stage to open the show with "All My Life." An alternate angle of the lookalike shows him landing awkwardly on his guitar as he hits a giant foam pad to break the fall. Here's hoping he didn't break anything else. Foo Fighters will round out a European leg of their Concrete and Gold tour this month before bringing it back to North America in July. Grohl had another close call with a stage in Florida last month.